AquaGuide.net - Where Do Aquarium Fish Come From? WHERE DO AQUARIUM FISH COME FROM? Today's hobbyist is unlikely to come across more than 300-500 of the 1,500 socalled aquarium species. Formerly, these went under the name of tropical fish, as they were caught in their natural habitats in tropical areas all over the world (see map on following page). Nowadays, 80-85% of freshwater species are bred in captivity, and by no means always in their native regions, so the term "tropical" is no longer appropriate. The dominant output is from South-East Asia, shared between Hong Kong, the Philippines and Singapore, accounting for over three-quarters of species. The neon tetra. for instance, originally from South America, is bred at the rate of thousands per month. Other areas of the world produce a limited range of species; some, like the former Czechoslovakia, are beginning to breed on a large scale. Breeders either use imported juveniles or raise their own stock, thus reducing the number of catches made from the wild and helping to preserve the natural fauna. All the same, some species no longer exist in their former abundance - for example in the Amazon basin - and proposals are afoot to declare certain areas protected zones to safeguard local populations. 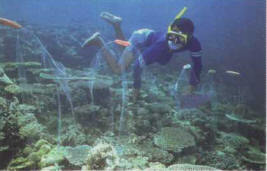 Catching tropical fish with a net. 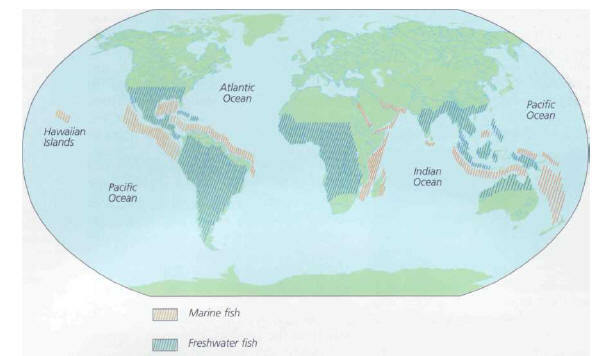 As for marine fish, almost all species are caught in the wild. Aquarists are frequently accused of abetting the plundering of coral reefs; the argument is that, for every fish arriving in our aquariums, nine die at the time of capture, during transport, or at various stages of handling. Without precise studies, it is extremely difficult to know the real effects on the natural environment of catches that are made to supply aquariums. There was a time when any method of catching fish was considered legitimate: explosives or cyanide were used to stun them, for example, inflicting severe losses on their populations. At the present moment, the genuinely professional firms employ more sophisticated and humane methods: a team of several divers works around a section of reef after sealing it off with a net. After selecting fish according to various criteria (especially size) and catching them in hand nets, they carefully bring them to the surface and house them in holding tanks to await export. Hobbyists do not keep protected species; it is therefore unfair to blame them for the reduction in numbers or disappearance of these fish from the wild. Most aquarium species exist in large numbers in Nature; some even provide a food source for the local human population. ЛАНГАНС Мартин Рудольфович (1852-83) , революционный народник. Участник кружка "чайковцев" и "хождения в народ", с 1880 член Исполкома "Народной. воли". В 1882 приговорен к вечной каторге. Умер в Петропавловской крепости.